Let's face it. A lot of commuters in Los Angeles ignore public transit. But that may change now that $4-a-gallon gas seems ready to become normal. The reality is, transit has continued to expand in the Metropolitan Los Angeles area. There are more options, and commuter lines are expanding. It is a decades old trend that originally found motivation in the benefits to be obtained from reducing congestion, pollution, and dependence on foreign oil. To that can be added the desire to pay less for gasoline. The Metro system can get you on all the rail lines and buses you can handle for a five dollar day pass. That's not much more than a gallon of gas. "That's one of the reasons why I don't use my car, because of the gas prices," said Eric Garcia of West Los Angeles. We've been here before. Before the global economic crisis of 2008 drove down prices, the average gallon of gasoline topped $4.50, and transit ridership jumped nationwide by 7 percent. 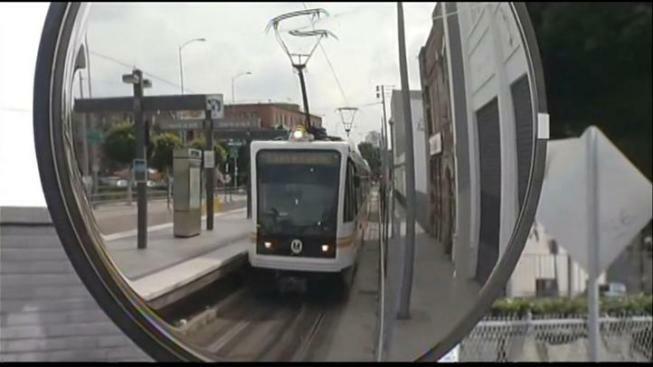 During a two-day survey at that time in Los Angeles, Metrolink ridership was up 16 percent. "Ultimately it is the economic factor that is the biggest contributor to public transit ridership," said Sunyoung Yang of the Bus Riders Union. "That contributes to ridership." The Union is hoping Metro will be able to hold the line on fares, and restore some of the cuts in neighborhood bus service in recent years. Metro has continued to expand its rail and dedicated lane service. Coming on line in the next few months will be two major projects: th extension of the Orange Line Busway in the West San Fernando Valley and the first phase of the Expo light rail line from Downtown Los Angeles to Culver City. "What we've always seen is that when people try transit, if they have a good experience, if they understand that it's easy, and if they've routed out that first trip right, they usually go back to it," says Damien Newton of LA.Streetsblog.Org. transit and even five dollar a gallon gasoline is not significant. UC Santa Barbara student Emily Westmoreland considered leaving her Mustang and taking Amtrak home to Los Angeles, but it did not pencil out. "It's a little cheaper for me to use my car," said Westmoreland. "But I definitely am for public transit." Unless you live and work at the end of a main line, with transit you also have to figure out your route and transfers. But Yang says Metro's web of routes and schedules is not as daunting as it may look. "If can pay taxes, you can figure out transit," she said. "It's not that difficult." She suggests rookie riders, and even experienced riders headed for a new destination, avail themselves of the trip planner on the Metro home page . There is dispute whether another widely encouraged initiative to reduce the number of vehicles on the road, carpooling, is winning more public favor. Metro has stated the addition of HOV lanes to Southland freeways, such as the 405, has increased carpooling. Newton disagrees, citing data in US Census surveys between 1990 and 2009, showing a decline in carpooling from 15% of all commuters to 11%. Why this would be is not clear. Newton's theory is that, at least since the tightening of the job market, it has been more difficult for working couples to find employment close by, and therefore they have been less likely to carpool. There are others ways, of course, for commuters to cut gasoline expenses, including switching to more fuel efficient vehicles, such as hybrids and pure electrics, not to mention Newton's favorite fuel-efficient vehicle: the bicycle.